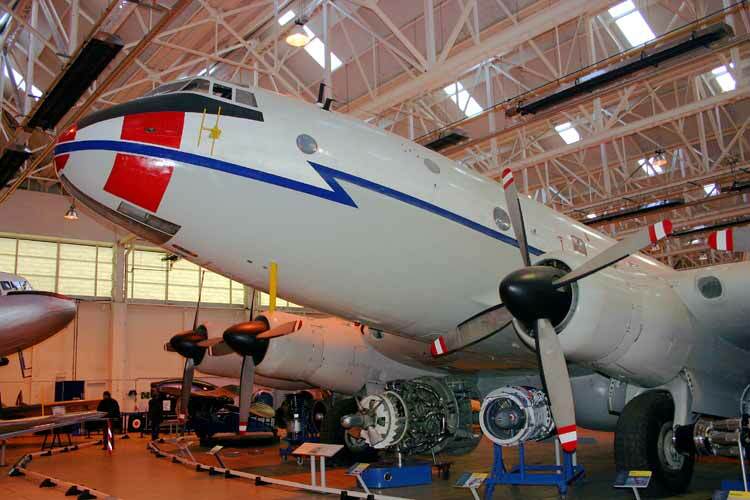 Designed to replace the Avro York the Handley Page Hastings was the mainstay of RAF Transport Command for a decade and was developed as a long-range transport that served with both the RAF and Royal New Zealand Air Force. The first prototype flew with four Bristol Hercules 101 radial piston engines on 7th May 1946 and the initial C.1 entered RAF service in October 1948. Production aircraft could accommodate 30 paratroopers or 50 fully equipped soldiers. 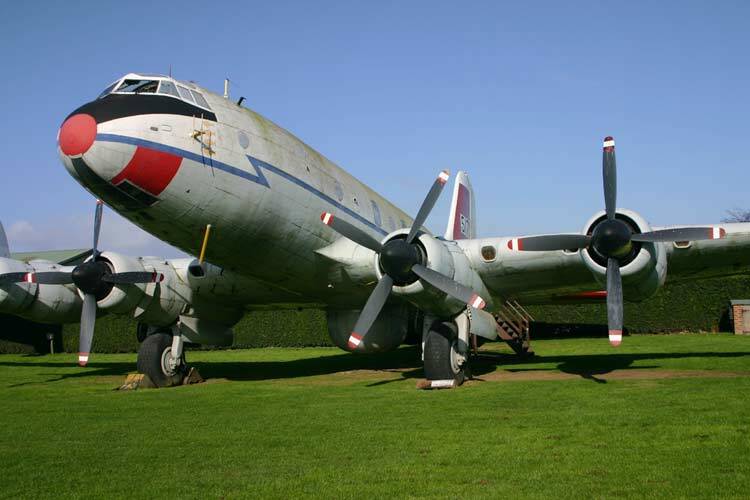 The first of 14 squadrons to receive it, in October 1948, was No 47, and this unit took part in the Berlin Airlift. The new aircraft served alongside the York throughout the Airlift (Operation 'Plainfare'), flying vital supplies into the city during the Soviet blockade. A Hastings made the last sortie of the Airlift on 6th October 1949. TG517 was the 19th Hastings C.1 to be built. 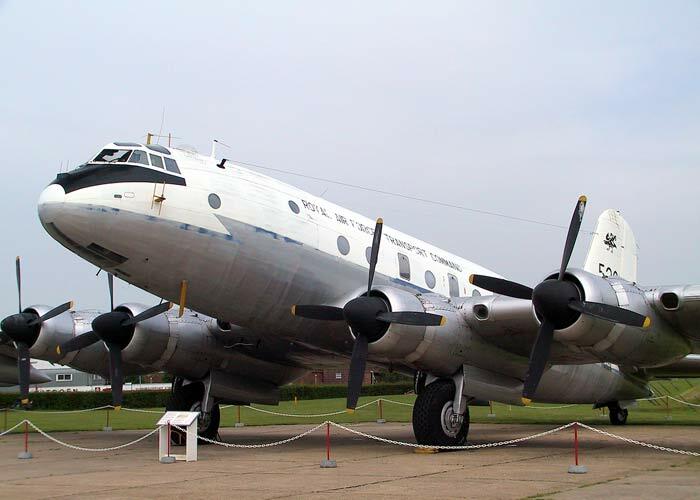 It was initially delivered to 5 MU in July 1948 and later served 47 and 53 Squadron, participating in the Berlin Airlift. It was the first C.1 to be converted to a T.5 variant for allocation to the RAF Bombing School [BCBS] and later served with the Radar Flight of No.230 Operational Conversion Unit. This aircraft also flew fishery protection sorties during the Icelandic 'Cod War'. TG517 was flown to the Newark Air Museum at RAF Winthorpe on 22nd June 1977 by Squadron Leader Jackson of No.230 Operational Conversion Unit. Production totalled 100 C.1s and 42 C.2s, the latter powered by four Bristol Hercules 106 engines in place of the C.1s Hercules 101s. Four C.3s were sold to the New Zealand service and four C.4 VIP transports were constructed. The C.2 had a larger tail plane mounted lower on the fuselage and increased fuel capacity. All C.1s were rebuilt to this standard as C.1As. TG528 was the 30th Hastings C1 to be delivered to the RAF and is in the colours of 24 squadron. It was converted to the C.1A variant with greater fuel capacity and range before its last serving with 24 Squadron at RAF Colerne, Wilts. It arrived at Duxford in 1979 and has subsequently been the subject of a four and a half year restoration programme. From 1950, the last C.1s were delivered as Met Mk1s for weather reconnaissance and flew in this role until the mid-1960s. Eight C.1s became Hastings T.5s, providing radar training for bomb-aimers at the Bomber Command Bombing School [BCBS] from 1959. By 1968 the Hastings had left front-line service with the delivery of Hercules and Armstrong-Whitworth Argosy transports, but none found their way on to the civil market. The last four served with the Radar Flight of No.230 Operational Conversion Unit (unofficially known as '1066 Squadron') until 30th June 1977. Flown to the RAF Museum at RAF Cosford on 16th August 1977 by the Squadron Commander of ‘1066 Squadron’ Squadron Leader ‘Jackson.